Set “Date received within last … days” to “7”. 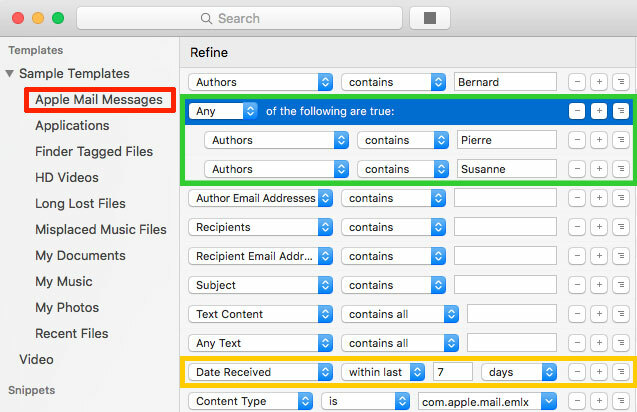 Set “Author” and / or “Author Email Addresses” if you want to restrict search results to a certain sender. If you want to restrict it to several senders, create a new group by clicking the “Add Group” button at the end of the row. Switch the group to “Any of the following are true:” and nest author names / addresses within this group. Use the + button to a new row. 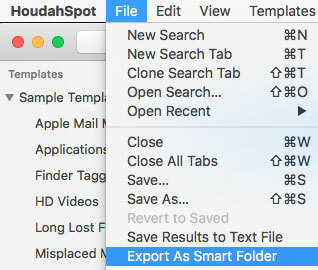 Name your Smart Folder and choose where to save it. 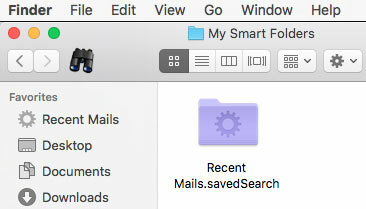 If you want your new Smart Folder to show up in the Finder sidebar, tick the respective box at the bottom of the save dialog. Because some of HoudahSpot’s search options are not supported by the Finder, values for locations exclusion, filters, custom columns etc. are not exported. If you want to retain these values, you may choose HoudahSpot’s “Save as Template” option. See also “Save Queries for Recurring Searches“.